If you’re like me and you like cheesecakes, yet only cares about putting it in your mouth and not worry about the process of making it, you will probably wonder what is a no-bake cheesecake. Well, simply put, it is a dessert that tastes and feels like creamy cheesecake, yet does not require the use of eggs or flour – hence eliminating the need for baking. Following me so far? Good! Couple of months back, Warden came up with the great idea of teaching my nephews how to make this dessert on my nephew’s (Colin) birthday. I was pretty surprised that the boys went for it, since they are usually stuck to the PC when we go over for dinner. We shall see how it turns out. Step 1: Crush some digestive biscuits. This is the easy part. Grab some digestive biscuits and crush them with the back of a spoon. Press, press, press. Boys like destroying stuff. Piece of cake. Step 2: Mix melted butter and brown sugar. 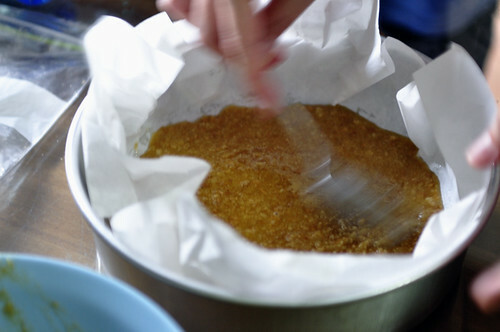 The melted butter and brown sugar is then mixed with the crushed biscuits, which forms the base of the cake. Press it into the base of a pan… or something. Next, chill it until firm. 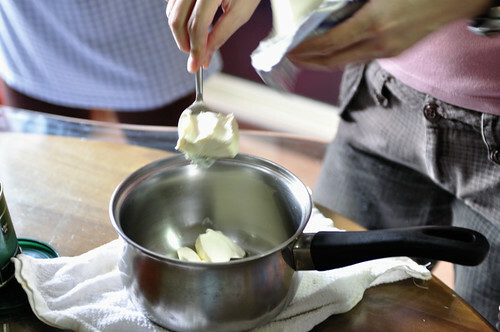 Step 3: Prepare and mix cream cheese. 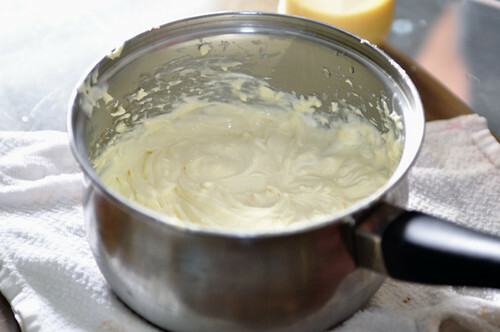 You can use a medium bowl, or reasonably deep pot to put the cream cheese. Then stir and beat well. 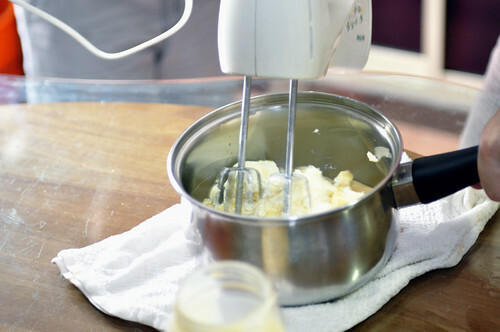 My advice is to use an electric beater, to prevent injury to wrist from the beating. 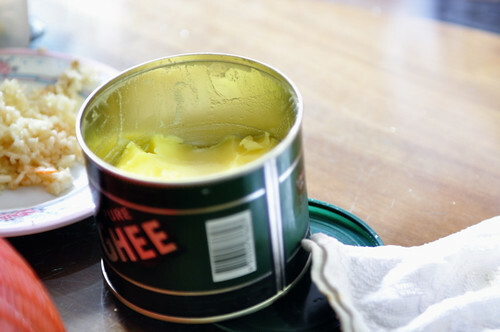 Beat to a firm thick creamy state. Step 4: Squeeze lemon into mix. Not too much lemon, or it just might be too sour for comfort. This is yet another young boys specialty. Step 5: Get helper to clean up mess. Optional step. Though it’s only right that they help clean up the mess. Anyway, the boys seem to like the taste of cream cheese. Step 6: Look really interested in the product. Another optional step, but every little bit helps. Voila! And there you have it. A no-bake cheesecake ready to be served. In all honesty, everyone liked the cake and we had fun in the process, including me. Wow … your site now is into cooking and baking?! Cool thing! Lol… I am into specialized Warden dishes only. Actually, this post was not really meant to be about the cake, but more of the visual process of making the cake with the kids. Oh this looks great! Yummy! And what great helpers you have!